Growing basil requires one main factor and that’s sunlight. It cannot tolerate temperatures less than 10 degrees Celsius. So it’s best to start growing them a week after the last spring frost. The only problem I have with growing basil is a lack of space. I cannot grow the amount I want. I usually use starts. I find it’s more convenient this way. I travel down to the local nursery and purchase some. (I also get some from my friend who also plants herbs in her garden). When I visit the local store I’m usually greeted by a host of various types of basils. You may think that variety is good but it can also bring the stress of choosing. I have a hard time making up my mind on which basils to buy. I fuss so much over the basils I choose because I plant them and use them in my meals. I don’t want to spend months planting and caring for these herbs only to realize that I don’t like the taste. So I always ask the gardeners at the nursery their opinion. After deciding upon a basil type(s), I take it home and plant them either directly into the ground or in containers. Because sunlight and heat are the main factors determining the success of the basil herbs I usually wait a week or two after the last spring frost to grow basil. These herbs cannot tolerate the cold at all. To ensure that the soil is warm enough, I test the temperature at night. When the soil is at least 10 degrees Celsius at night then it is warm enough for the basil to grow. If you plant basil when the weather is too cold the leaves become black and die. If you grow them from seeds, the seed may not sprout. They’ll remain sterile in the soil. I also select sites that get 6 to 8 hours of sun exposure. So if you’re growing basil too then do the same. Even if you’re in the city try placing the containers on the window sill. Or if you’re more adventurous (and your landlord allows it) use the rooftop to place your containers. The soil type is also important. Basils love rich soils that are well drained. So loamy soil is the best soil for this herb. If you have compost, mix it in with the soil in the container or the backyard. Next I add water to the soil before inserting the basil. It makes the soil stick and allows the basil to hold firmly into the ground. Dig holes about 4 to 6 inches deep and 4 to 6 inches apart. This gives them enough room for them to spread as they grow. 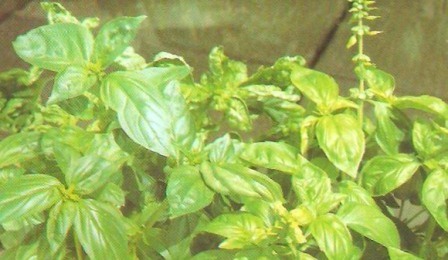 If you observe the basil herb you’ll see that the leaves grow in groups all around the stem. And when I see 3 to 4 groups of leaves I begin pruning. Ensures that the remaining leaves get a higher concentration of essential oils. This is important for taste. Too much leaves cause the taste to become milder and less effective. If the herb isn’t pruned it grows thin, tall and unattractive. But when pruned, it expands and looks more attractive in the garden. What I’ve been told and have found from experience is that basil has a stronger taste if you don’t add fertilizer feed. I’m not sure why though. Basil is my number one herb for adding flavor to my meals. Every type has its own unique taste. This is what makes them so popular amongst gardeners and chefs. I love using them because recently I’m trying to prepare more Mediterranean style dishes. It is believed that these dishes are amongst the healthiest in the world. So growing basil (and other herbs) is a convenient way of getting ingredients to prepare Italian dishes for my family.